Time: 17.00 for 17.15 pm, last Wednesday of each month. Come early for networking. ABIME AMA Guides Training with Traumatic Brain Injury and Medico-legal Report Writing Workshop. The 1st day program is entirely devoted to two new very practical workshops that are highly relevant to the Medico-legal and IME practice. The workshop on Return to Work and Fitness for Duty evaluation is specifically designed to learn medicolegal issues related to disability claims. The Medico-legal Report Writing and Court Testimony Skills workshop is specifically designed for Medical Doctors/Surgeons of all specialties, psychiatrist and other health care providers to learn Medico-legal Report Writing and how to start, build and successfully run an Independent Medical Examiner/Expert Witness Practice either part-time or full time. The 2nd day and 3rd day consists a NEW & UPDATED AMA Guides to the Evaluation of Permanent Impairment training that includes an entire day of 20 complex case studies of Disability Assessment . American Board’s Faculty will show you how to get started in your Independent Medical Examination (IME) practice including Road Accident Victim evaluations (RAF claim) and how to quickly build a sustainable, lucrative IME practice and how to perform excellent IME based on the AMA Guides 6th ed and fill out the RAF4 form. There is also an option available to sit for the ABIME CIME diploma exam. This AMA Guides 6th Ed. Training and other IME skills Workshops are very popular and only taught once per year in Johannesburg by the world renowned American Board Faculty. To register online click here OR for more information download AMA Guides 6th edition Training and other IME skills Workshops brochure and fill it out and email to info@abime.org. Early bird available until the 15th December 2018. Are you (or would you like to be) a Medico-Legal Practitioner? SAMLA Training Programme for 2019 – 2020. Information about the eagerly awaited second and third sections of the SAMLA training in Medico-legal Practice – The Practical Workshops. The 10 practical workshops follow on the theoretical underpinning in the Foundations Course in Medico-Legal Practice and Ethics presented during 2018. The new training format: In order for SAMLA to present its training to our members all over the country and to get maximum CPD points, the next two levels of training will be presented as a series of workshops rather than year-long courses – 5 workshops in 2019 and 5 in 2020. Each year will build on the skills and experience developed during the previous year. There will be live presentations in 5 venues (instructions and discussion) as well as practical work to be done in syndicates. Syndicates will be licensed so that participants can communicate online with each other to work on their assignments. The 2019 training is open to all interested persons, whether-or-not you did the 2018 training. To qualify for the 2020 workshops, you will have had to complete both the 2018 and 2019 courses satisfactorily. But, here’s the good news – The 2018 Foundations Course will soon be available as an e-course, so for those who missed the boat the first time, all’s not lost. Maximum CPD points – the total number of points for the workshops done separately will be considerably more than if the training is presented as a single course. You can obtain a certificate of completion for the whole course by completing all the workshops in each of the following two years. Persons interested in specific workshops only, may do so in 2019. They will receive CPD points and a certificate of attendance per workshop. More payment options (and perhaps kinder on the budget). You can pay per workshop and do not have to find the full course fee upfront. Discounts will apply to SAMLA members and for those who pay for all 6 of the 2019 events upfront. At present the costs are provisional, the current estimate is based on a minimum registration of 220 participants. As you may appreciate, the organisation with many “moving parts” is quite a challenge. In order to secure venues and technicians; to complete the arrangements timeously and to be able to present the training at competitive rates, we need confirmed interest from at least 220 participants for the full year or 2019 Workshops. Part 1. Interviewing Skills for Medico-Legal Practitioners – Various Professional Perspectives. How to raise your game from the get-go. Part 2 – New developments in the Legal Field: Implications of the State Liability Amendment Bill for Medico-legal practice. 2019 Course – Introduction to the Workshop Series and explanation of syndicate structure. 2. 2 March and 16 March – Workshop 1. 3. 6 April and 4 May – Workshop 2. Psychological Consequences, Emotional Shock and Constitutional Damages. 4. 1 June, 13 July and 17 August – Workshop 3. 5. 7 September and 12 October – Workshop 4. 6. 2 November and 30 November – Workshop 5. *Further information regarding the Online Course and the Series of Workshops for 2020 will be provided in due course. Please visit the SAMLA website https://medicolegal.org.za for updates. *Please also ensure that your SAMLA membership is up-to-date to take advantage of the discounted rates. The Wechsler Adult Intelligence Scales has undergone various adaptations over the years. 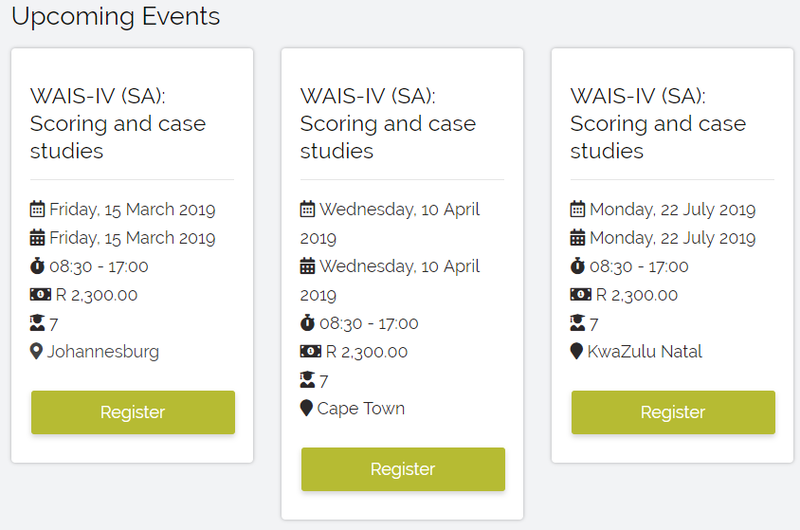 The latest version, the WAIS-IV has recently been standardised for the South African population. The purpose of this one-day workshop is to discuss the structure of the assessment and the research that was done to create South African norms. Basic principles in the administration and scoring of the instrument will be discussed and practiced. Workshop participants will gain further insight into what the test measures, and how to interpret the scores by means of in-depth case study discussions. Although participants will have the opportunity to apply their own knowledge and skills when interpreting the profiles of these cases, interpretation guidelines will be provided and handouts will help to facilitate the process. if so desired in order to discuss this with the group. for various magazines, and currently writes for the online parenting portal, BabyYumYum. She has featured on SABC Radio and 702. For those who had limited training or exposure to the SSAIS-R and professionals who wish to attend as a refresher workshop. with cerebral palsy, physical disability and specific learning difficulties. memory) are discussed and tests 1-12 are covered in detail. use the JSAIS in today’s present context? test-specific observations that can assist your process. JSAIS process opportunities for school readiness assessments. • Case study approach: A look at several variations in JSAIS results. Mr Andreas Baron is an Educational Psychologist with an interest in education and the development of potential in learners. As such, fields of interest stretch from working with learners who experience barriers to learning through to career counselling in a private practice and school setting. He currently works in private practice and is also involved in medico-legal work. Attendees are encouraged to bring raw data and case examples if so desired in order to discuss this with the group. Dr Ronelle Venter is an educational psychologist with 32 years’ experience in private practice and was a Senior Educational Psychologist at Muriel Brand School for learners with cerebral palsy, physical disability and specific learning difficulties. Dr Venter is a consultant for various schools. 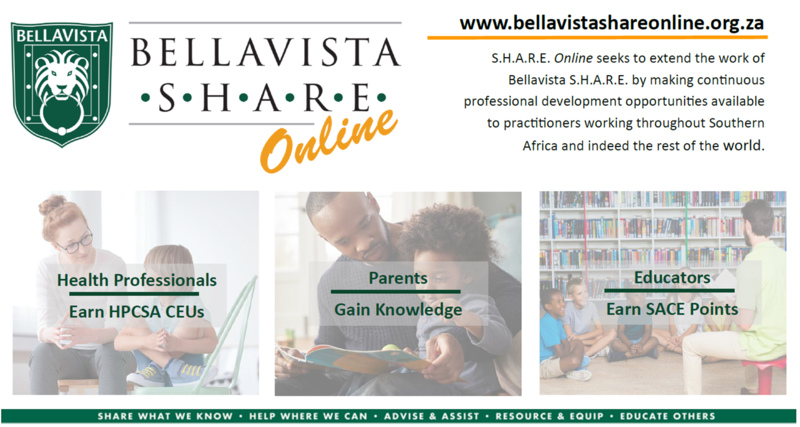 Speech & Language Therapists, Occupational Therapists.